Sciatica is also called lower extremity radiculitis or radiculopathy, and refers to pain that radiates along the path of the sciatic nerve. As the longest and largest nerve in the body, it controls and innervates many of the muscle groups in the legs and feet. It also provides sensation to the thighs, legs and feet. Due to its size, many conditions can cause sciatica. 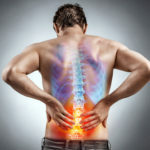 The most common cause is a herniated or bulging disc. Other conditions that can cause sciatica include spinal stenosis, piriformis syndrome and facet hypertrophy. This condition is characterized by weakness or sensory changes sometimes described as the feeling of pins and needles down the buttocks, legs and feet. Patients experiencing bladder or bowel incontinence, weakness in the legs and feet, extreme numbness or severe nerve impingement should seek medical help immediately. These symptoms could indicate a very serious medical condition that requires immediate treatment. A physician will diagnose sciatica by collecting a medical history and performing a physical exam. 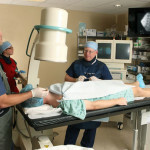 Imaging such as an X-ray, MRI, CT scan or bone scan may be ordered to confirm the diagnosis. Treatment options include using a TENS unit, massage, physical therapy, exercise and healthy diet. The doctor may prescribe non-steroidal anti-inflammatory drugs (NSAIDs), acetaminophen, membrane stabilizing drugs, muscle relaxants and occasionally opioids to help with pain. Epidural steroid injections or trigger point injections may help calm inflammation around the nerve root. Spinal cord stimulation may provide pain relief for patients who do not respond to the previously listed treatments. If conservative treatment options fail, surgical intervention may be necessary.